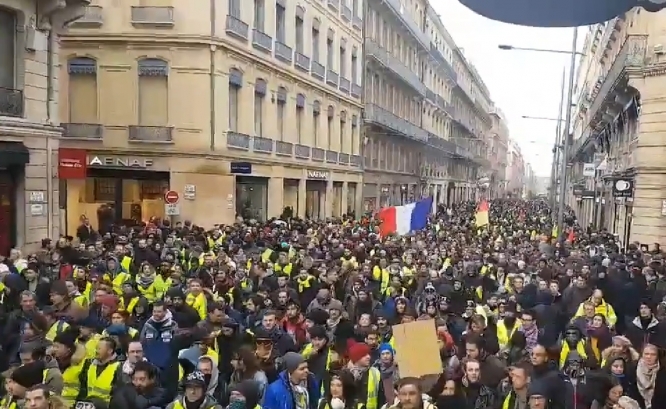 The gilets jaunes movement has claimed a resurgence in protesters after this weekend’s “Acte 9” saw between 84,000 and 92,000 people come out across France, including over 8,000 in Paris. The rise in numbers comes just days before President Emmanuel Macron is set to open the “big national debate” on Tuesday January 15. In Paris, protests were peaceful around Bercy, Place de la Bastille and Place de l’Etoile from 11h, but tensions rose mid-afternoon, with 156 people having been arrested by 19h. Two firefighters - Simon Cartannaz and Nathanaël Josselin - were killed in Paris when a gas leak caused a serious explosion on Rue de Trévise in the city’s 9th arrondissement, but the incident was unrelated to the protests. Bourges (Cher) was the second-most popular site for this weekend’s protests, after gilets jaunes leaders dubbed it the “centre of France” and the most logical place to continue the movement. Over 6,300 protesters were counted there, with only a few people arrested. Some shop windows were smashed, but most violence appeared short-lived and contained. People marched “in peace...without serious incidents”, Mr Castaner added, as “responsibility prevailed over the temptation of confrontation”. Across the rest of France, Bordeaux and Toulouse saw over 6,000 people; Saint-Etienne 5,000; 3,500 in Rouen; 3000 in Lille, Perpignan, Toulon and La Rochelle; and 2,500 in Marseille. Significant street damage was reported in many cities, including Toulouse; with water cannon and flash balls used by police in Paris and Bordeaux especially. Protesters say that over 92,900 came out across 73 towns and cities, while the minister for the Interior puts the number at 84,000. Over 80,000 police and gendarmes - including some armoured vehicles - had been stationed throughout the country - including 5,000 in Paris - as authorities had feared more violence. Yet, few serious incidents were reported, except in Nîmes (Gard) when a group of protesters clashed with the CRS as they attempted to approach the local government buildings; and Nantes, where some cars were smashed and torched. By the evening in Nîmes, 22 people had been taken into hospital, including two people in a critical condition - of which one was a police officer. The latest weekend of protests in France comes as the gilets jaunes movement continues to gather pace outside the country. Saturday January 12 also saw marches in London, UK; and similar protests - where people show up dressed in the distinctive “hi-vis yellow vests” - have also been seen in Italy, Germany, Belgium, Serbia, Sweden, Holland, Greece, Bulgaria, and as far afield as Canada, Israel and even Iraq. In Egypt, authorities are reportedly so afraid of the movement's spread that they have banned the sale of yellow vests.